Solar Art installed decorative window film in Seattle, Washington to a commercial office building. 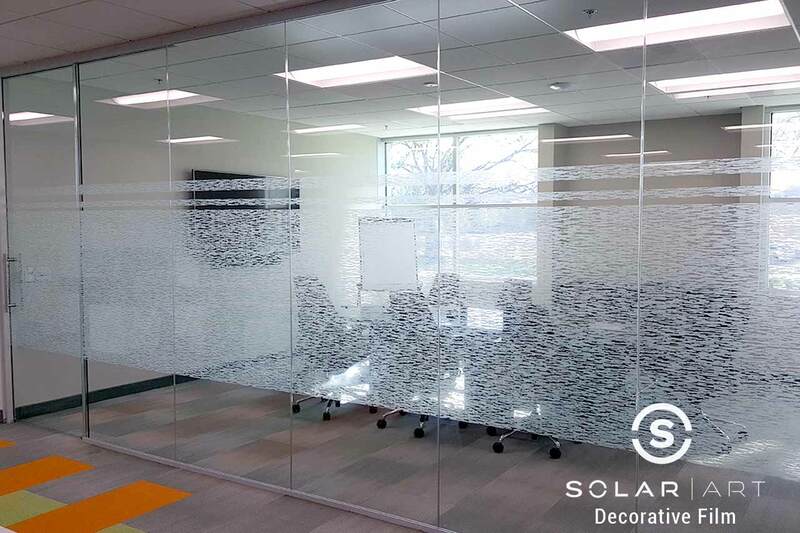 We installed a Solyx decorative film called SX-9100 Chicago. The customer was looking for a film that would pose as a design factor and also create office privacy and conference room privacy. The customer did not want opaque window film like frosted window film or blackout window film where you can’t see through it at all. With a decorative film like SX-9100 Chicago, the space is not totally blocked by the window film. Decorative film comes in a variety of different patterns and shapes depending on what you are looking for. Patterned window film includes anything from frosted stripes, to frosted squares, to dots and other geometric shapes. Dry erase film is another popular option for conference rooms and offices. Dry erase film can be applied to both walls and windows. Both dry erase film and decorative window film is also frequently installed on homes. Solar Art has installed dry erase film to home offices and studies for both adults and children. We have also installed decorative film such as frosted window film to pantry and laundry rooms where the customer wanted to hide what was behind the glass. Decorative window film can not only increase privacy in any space, but it can also increase safety. By installing the window film it draw attention to the glass to ensure no one hits it or runs into it. Decorative window film is applied the same way as solar film and security window film and is easily removable with no damage to the glass. Just like solar window film, decorative window film protects against 99% of UVA and UVB rays and can reduce the amount of heat and glare that enter a space. Contact us directly to talk with us about Decorative Window Film!